The AYC Fleet Captains have met to craft the documents for the fall racing season, so we’re getting close. Registration should open soon and the documents will be on the website even sooner. The Fleet Captains decided to cancel the scheduled first race of the Tempe Town Lake season, which was planned for August 28, thinking that we should take a breather between the end of the Heat Stroke series and the beginning of the fall season. 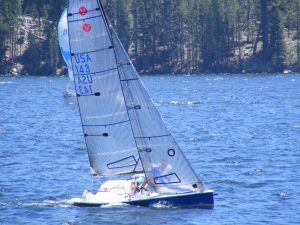 If all this race stuff has you intrigued but you’ve never raced before, remember that the Arizona Sailing Foundation presents an Introduction to Sailboat Racing class to get you up to racing speed quickly. Registration for the class is open now. And this fall we’ll have a new, low-pressure racing fleet, the Green Fleet, which will take starts, but skip one thing: scoring. No scoring. With the addition of several J/80s to the club, we also have a new Sport Boat Fleet for monohull boats with asymmetrical spinnakers. Vipers and J/80s will be the main participants.